I promised to have a LIVE tweet but I was too overwhelmed meeting up fellow bloggers, looking and taking shots of toys, games and comics and didn't do much tweeting. It was a tiring night but I was very happy of the whole event. I was very glad to meet up with Joshua, Dennis, Bayu, Juliana, Adrian and Kodomut. 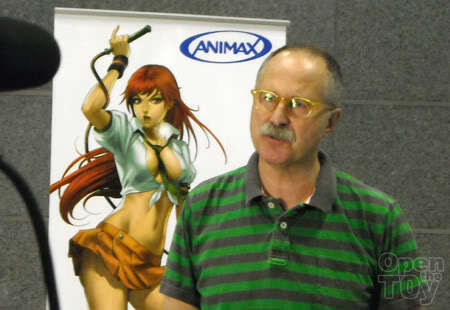 I also would like to thank Daphne from STGCC for the invitation. Warning: This would be a long post. 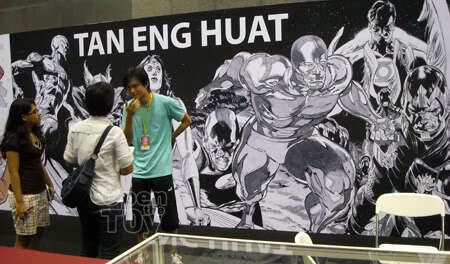 Without further ado, here are my coverage on the STGCC Opening nights. The Official opening started 630pm with the organizers and guest of honor Mrs Yu-Foo Yee Shoon, Minister of State, Ministry of Community Development. Youth and Sport of Singapore. If you want to witness the opening ceremony can be found on Joshua, Bayu and Adrian blogs. So that is the opening. Now the coverage on the "What's so fun" about the event. 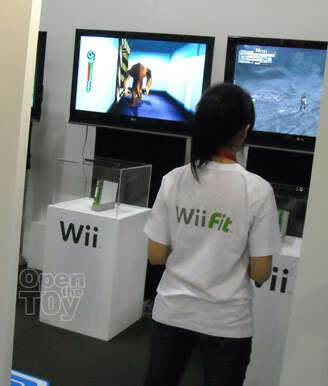 When we first enter into the convention, there was Nintendo with their Wii and NDS. 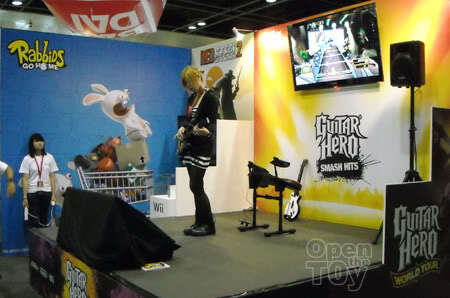 One gal was playing Guitar Hero on Wii on stage. 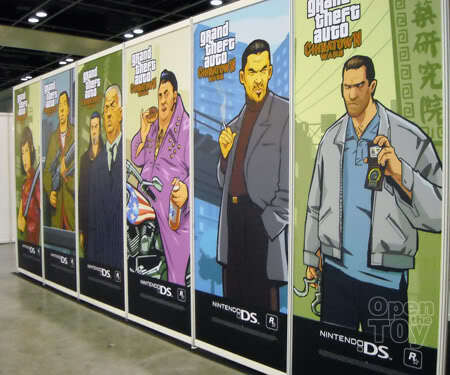 I saw GTA Chinatown wars posters. Now that's marketing. 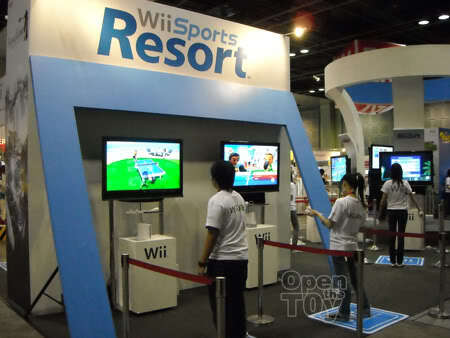 Did I said they are selling Wii? 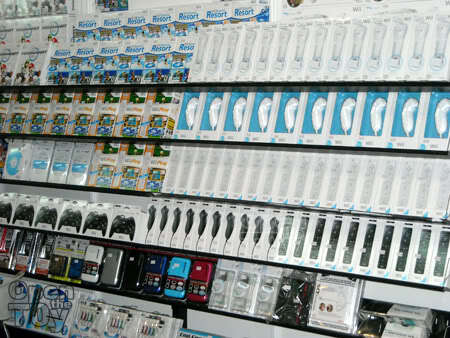 Lots of Wii? 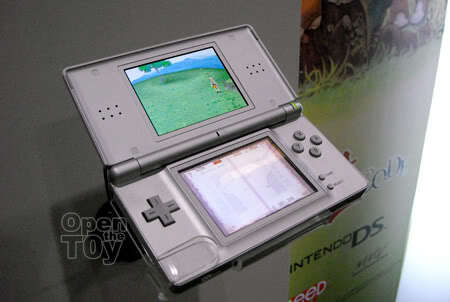 And NDS for anyone to try their game? That's what convention is all about, trying of games. 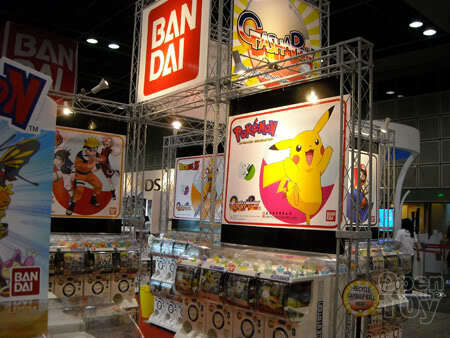 Nintendo really have a big floor space this year in STGCC. The new games are free for all to try if their staff were not busy playing demonstrating the games rather than invite anyone to try... Doesn't matter, I had my Wii at home. Come to think of it, isn't this the best job in the world? Paid to play game? Man, if you have such opening, PLEASE let me know. I am all for it and maybe I will write a review and walkthru of the game too! See the new Ben 10 Alien force game there? Hey! Are you looking at the gal or the game? 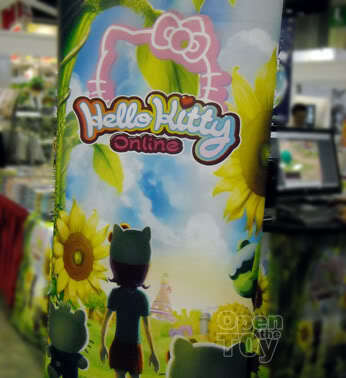 What wow me for games was none other than Hello Kitty Online! I was thinking seriously? Hello Kitty Online?! Just went you think you can create a race of Hello Kitty or Badtz Badtz Maru, I was told that they are NPC... what's the fun of that? I was given a free game disc to take home to try. Nice packaging. 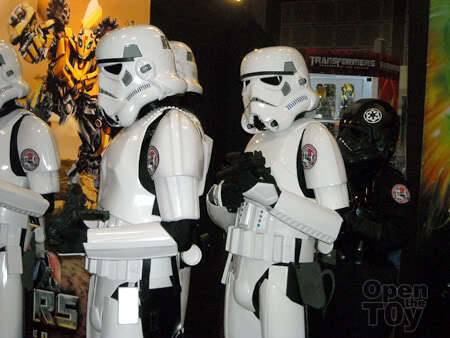 I didn't see much Cosplay except for the 501st legion. I guessed the cos players will be there when it is open to public over the weekends. So here are the cosplayers of 501st legion. 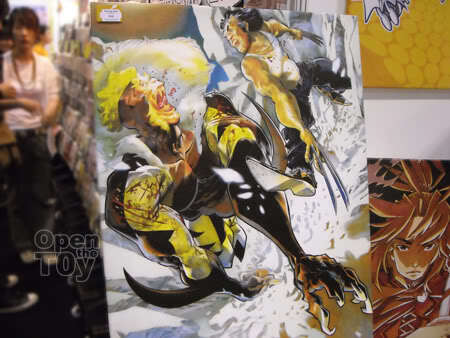 If you are a fan in English comics, there are good deals as they are selling USD $1 is to SGD $1 and it's hard cover! How good is that? 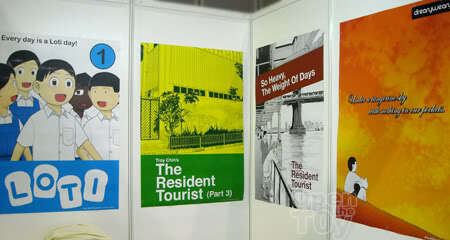 Here's some of the artist works you can get to see there. 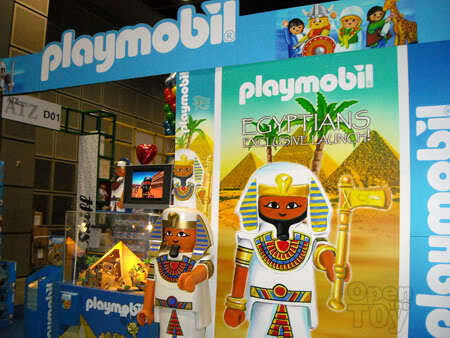 At one corner was Playmobil. 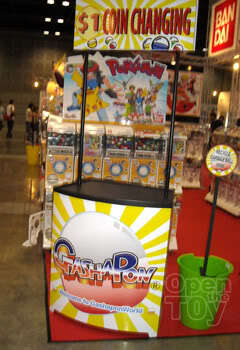 ToyREvil did a write up for Playmobil at STGCC by the way. 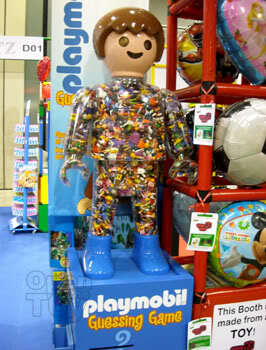 Guess how many playmobil are in this one Giant Playmobil? You can try your luck there. 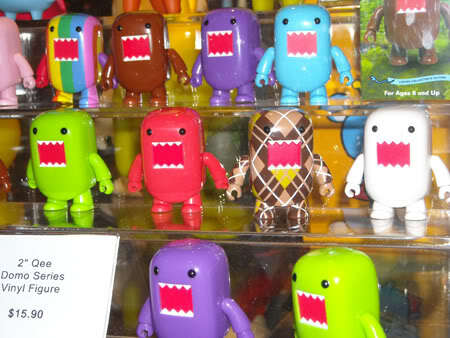 Domo were on sale too! Choose your favorites for just $15.90!!! 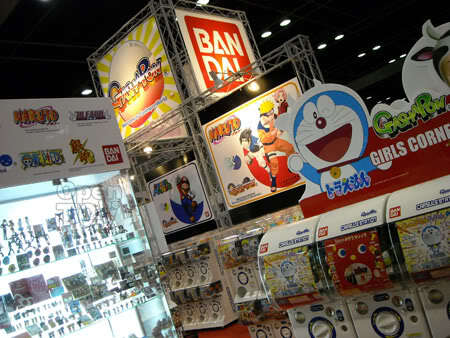 Around that area, tons of Gashapon Machine!!! 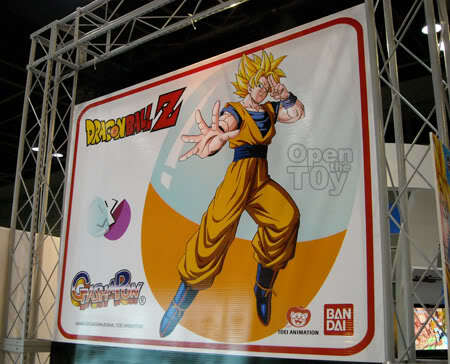 And then finally Dragonball!!! Now we are talking. Just when I want to change my coins... the booth was empty!!! Great! forget it then. 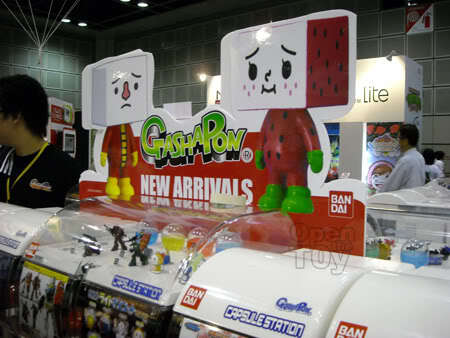 I was interested in the paper Keroro and Masked rider and so was Adrian who is into making paper toys. Adrian did a in depth coverage of the paper toys there. 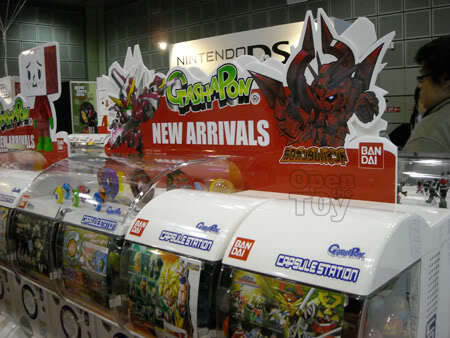 Hasbro and ToyRus is there. How would they missed this convention? 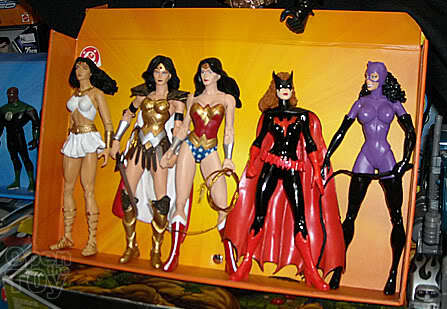 There are just too much toys to cover but thankfully other blogger are making coverage on that. 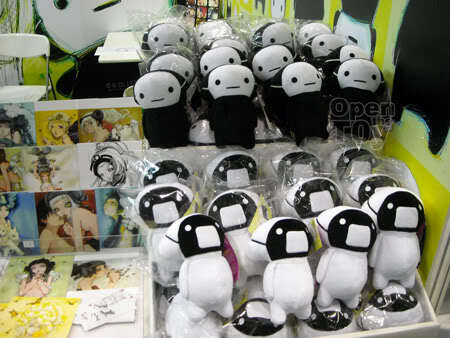 So head over to the bloggers who are there on STGCC opening night! You still here? Good here's some extras. 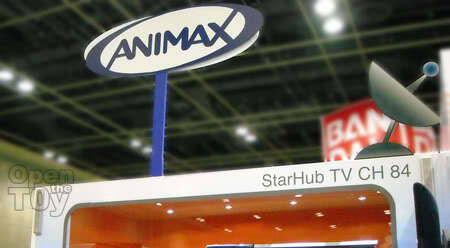 When Animax come to know we as bloggers, we were invited to do a voice over for anime just for the fun of it. You hear me. Voice over in a sound proof room like this. 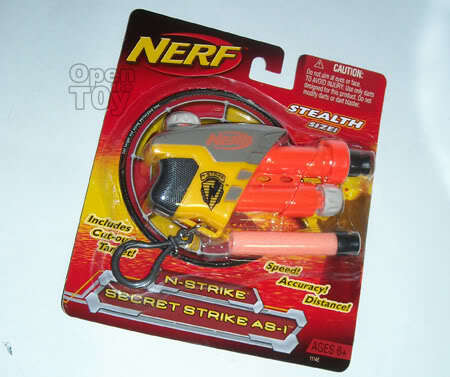 Adrian make some purchases and was given a nerf gun. He was generous enough to gave it to me. Thank you Adrian! I will review this later. We took a group bloggers with fellow bloggers like Alex and Ken Moo except for Juliana as she went missing during the phototaking. I would be there tonight to meet with desmond to soak in the atmosphere for the first day for public opening. Will report that on the next post. See you guys there! Wow what a show! I wish we had conventions like this here too! So much toys! 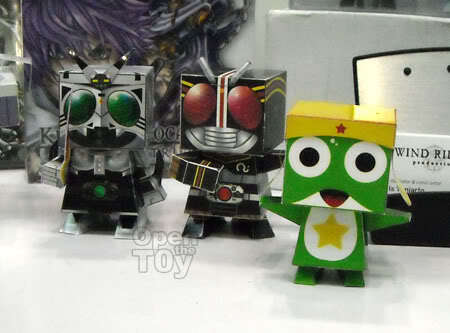 I really like the paper toy Keroro and Kamen Riders too! 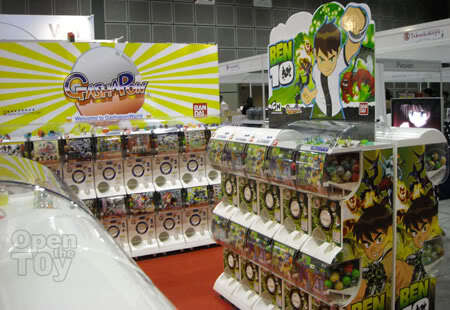 The gashapon selection looks interesting too, never knew there was Ben10 gashapons. I am surprised Nintendo is there too! Can't wait for more pics to drool over! The papercraft is awesome. Looks like missed it and got to go back on Sat to take a good look! the designer toys are kidrobots and i love them. i custem designd two of them . Come to Singapore next year for the event! Dennis will be going on Sat. See if you can meet up with him. You did?! Share with us! 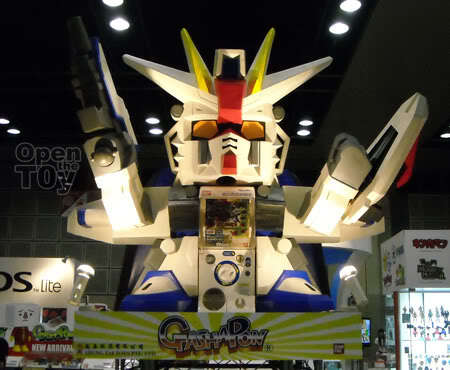 The papercraft was created by my friend, actually, his name is Is Yuniarto, he's from the same "village" like me, hahahaha. I'll pass your comment to him tomorrow. I didn't know that. I was there with Adrian but the maker was not at the booth at that time. He got a blog? 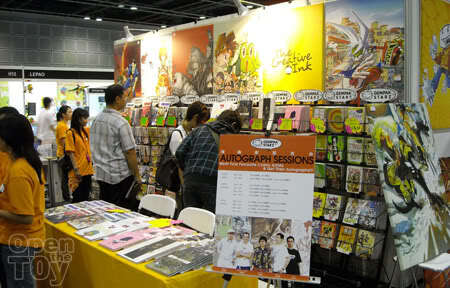 Thank you so much for the invitation to attend and cover the opening night of STGCC 2009! 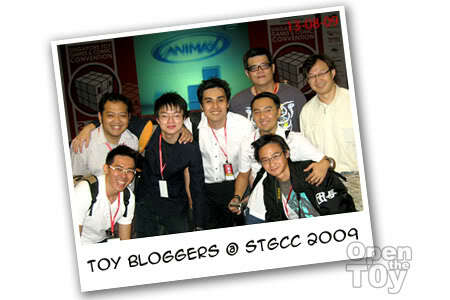 It was a great experience for me and a chance to finally meet up with you and other fellow toy bloggers whom I've been communicating with online! 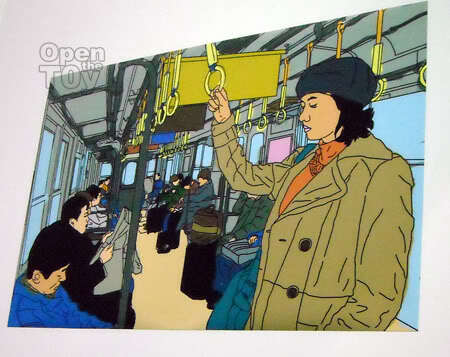 Yar Bayu I want to know the paper craft artist. Awesome coverage LEon! I too wish we had shows like this here. Looks awesome and must be great to get in there without the crowds, then enjoy with the crowds. Have never really seen anything with so many top companies like this in the UK. As usual, thank you so much for your great coverage of STGCC opening ceremony. Nice meeting you yesterday. Alamak! forget to take pictures with you guys that night.. Thank you! 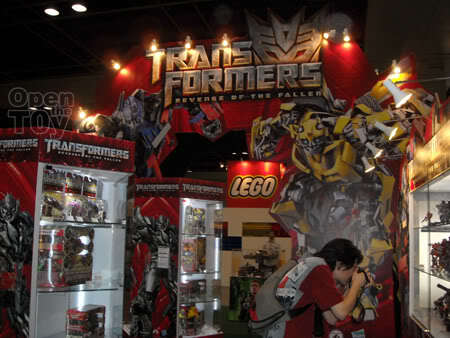 It would be wonderful should UK have such Toy convention. Nice meeting you too bro! We must take picture next time we meet! 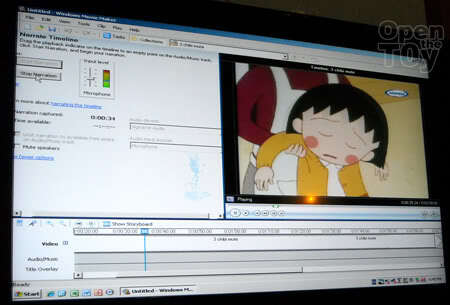 Great pics taken, editing and narration. I have been going back to the convention and today is my third day. It's like a festival to me. I bought Gundam DVD & my wife, the Domo camouflage T-shirts. 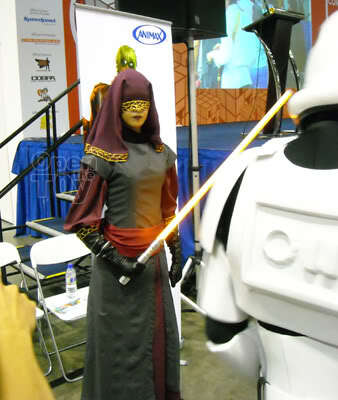 yup that female sith lord is the same female jedi u saw at the toy carnival last month. she is one of us now. muhahaha.